Due to Hurricane Michael we may not be able to deliver loads on October 11th, 2018. An official decision has not been made at this time but our staff may not be at the office on October 11th, 2018. We are monitoring the situation and potential for port closures. At this time the port has indicated that they are watching but the potential exists for the port to close. In the event of an emergency or if you are unable to reach our office please call Stephanie Wagner (Terminal manager) at 912-414-1160. Freight trucking has long been economically vital but fraught with hardship. Now a driver shortage is bringing new racial and gender diversity – and a change in on-the-road lifestyles – to the work. Uber has announced that it is shutting down its self-driving truck program. The move comes as Uber’s self-driving technology has come under fire after one of the company’s self-driving cars struck and killed a pedestrian. Two years ago, Uber reportedly paid $680 million to acquire a startup called Otto. This was the start of Uber’s self-driving truck program, but also the beginning of a long legal battle. Otto had been co-founded by Anthony Levandowski, a former engineer at Google’s self-driving car division called Waymo. According to Waymo’s suit, Levandowski had started Otto using trade secrets taken from Waymo. This meant that Uber was now allegedly in possession of self-driving tech from Waymo. Just one week after the trail began, Uber settled the suit with Waymo by giving the company $245 million worth of stock. So after two years and spending – by some estimates – over a billion dollars, Uber is closing down their self-driving truck program. According to Uber though, the company is folding employees from the truck program into their self-driving car program. “We’ve decided to stop development on our self-driving truck program and move forward exclusively with cars,” said an Uber executive according to The Verge. Even Uber’s self-driving car testing is struggling however. After the fatal accident, Uber pulled its self-driving cars from the road. Now they’re operating again in Pittsburgh, but human drivers are controlling the vehicles at all times. Besides $$$, what are drivers looking for when they pick loads? Due to a continued decline in the number of people driving trucks, we are now living in a time when truck drivers are in a position to call the shots more than ever. Below are some of the things we see drivers looking for when they decide which locations they want to deliver to. 1) Locations they can get to without much traffic. Large metropolitan areas rank low when drivers select delivery locations. 2) Open receiving, or early am time deliveries (preferably 4-6 am) so they can get in and out when traffic is lightest. 7am to 10am and 3pm to 7pm tend to be less desirable times due to heavier traffic. 3) Friendly warehouses - drivers feel they are disrespected in general and they like to go to warehouses that treat them and their time with respect. 4) Fast unloading/loading - Drivers prefer to get in and out quickly so they can get back on the road where they really make money. Time spent waiting to get to a dock, waiting to get unloaded and waiting for paperwork are all issues drivers consider when selecting loads. 5) Weight - heavy weights cause the drivers to driver slower which cuts into their profits. Heavier weights also cause more tire issues and wear and tear on the equipment so if they are going to haul heavier weights they want to be properly compensated. 6) Drop and Hook - drivers prefer drop and hook so they don't have to wait to get unloaded. 7) Ample parking and facilities - some drivers like to arrive early the night before to ensure they arrive on time before traffic picks up. Locations that provide parking and bathroom facilities are much more likely for the drivers to pick than locations that have no where to wait. These are things to keep in mind to help us provide freight for drivers that they enjoy handling. Keeping drivers happy will help us ensure we have drivers to continue to deliver your cargo. Despite the above challenges, SeaLand remains committed to delivering as your single partner from end to end. Our commitment to you is to act as a true partner in defining the new normal within the current trucking landscape and to remain agile as it evolves. In order to secure our promise to deliver against your store door needs, we will introduce an increase to our inland tariff, effective April 14, 2018. Despite the operational constraints presented in the trucking market, you have our commitment to strive for compliance with your booking requirements. We will continue to actively monitor the situation and provide timely updates on changes that may impact your supply chain. If you have any questions, our SeaLand Representatives are prepared to take care of you. Give us a call, email us at customerservice@sealand.com and we’ll be happy to help. 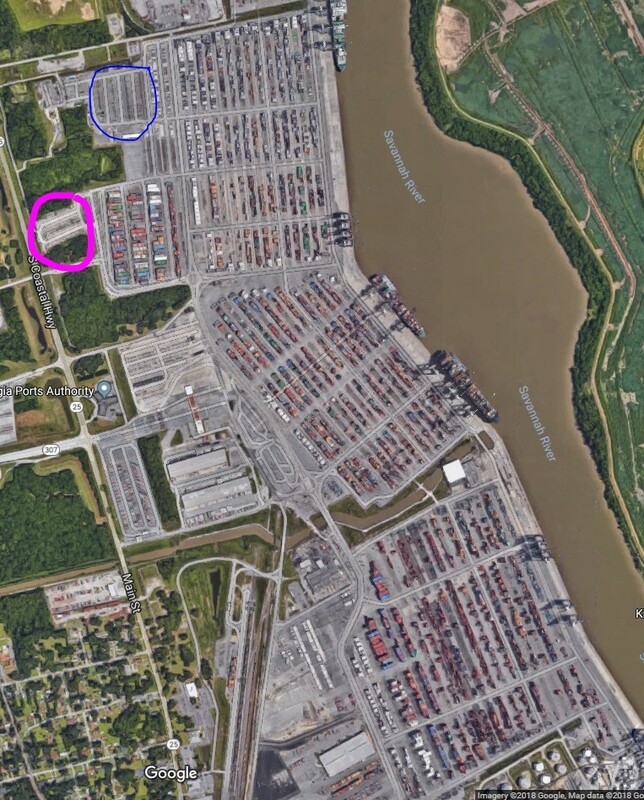 Just to put it in perspective, below is a aerial of the port. The pink circled area is the chassis pool. 6 months ago it was about 3 times this size as indicated by the blue section but they took this space to open another gate. I zoomed in and counted and there are approximately 150 spots in the pink section. Granted, they can stack chassis but also keep in mind that according to the drivers there are about 1/3 out of service at any given time and unavailable to use. Now, think about the fact that the port is handling 10,000 transactions per day. That is 5,000 containers going in and 5,000 containers coming out. Look at all those containers on the ground, in most cases stacked about 5 high and then the available chassis. This is just to demonstrate that if you don’t already have chassis when you go in the port it is very difficult to get one. I drove by yesterday as you can see the chassis pool when you drive down Hwy 25 and there were none stacked when I drove by and about half of the spots were filled, I am not sure how many were out of service but I suspect a lot. This is why it is so important to have inbound container when we are pulling outs. For the last few months we have been bombarded with an increased number of quote requests, work orders and clients begging us to take freight at a premium price. On January 10th, 2018, Jason Hilsenbeck, from loadmatch.com and drayage.com, wrote in an email to many drayman in Savannah "If you phone and email have been blowing up, Savannah metro is 2nd highest in demand for entire country." Many people are interested in understanding what is going on. Below is a summary of the reasons we are experiencing capacity issues. 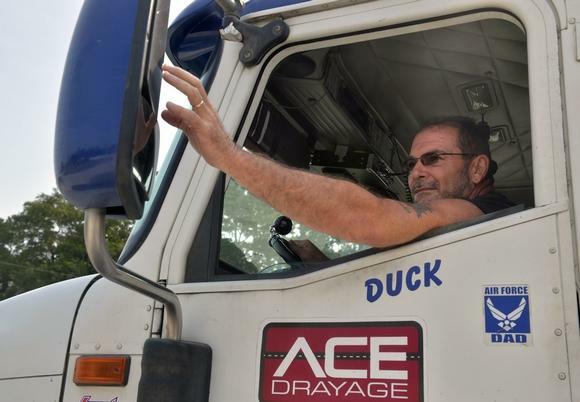 1) Driver shortage - The for-hire trucking industry is facing a shortage of drivers. Estimated shortages are roughly 50,000 drivers. Reasons include regulatory issues, lack of home time, stagnant pay, lack of respect, rigid delivery schedules and inadequate equipment. Regulatory Issues - On December 18, 2017 every driver that travels more than 100 air miles in a day or has a 2000 model or newer truck is required to have a device installed in the truck that tracks all of their drive time. Prior to this, drivers kept paper logs. Many drivers are not familiar with this technology and chose to exit the business because they lack the training necessary to work with the new system. Many drivers see this as an invasion of privacy and have chose to find other work. Many drivers believe that this will prevent them from being as productive and chose to leave to pursue other opportunities. In some cases, drivers feel that the rigid computers will cause them to spend more time on the road and if they aren't going to have adequate home time then they prefer to driver over the road domestically and make more per mile than regionally with containers. Stagnant Pay - in the past 11 years a McDonald's employee has seen a 94% pay increase, the minimum wage has increased over 45% and for-hire drivers have seen a 6.3% pay increase. The failure to increase wages has created a situation in which new drivers have no incentive to enter the industry, thus a pool of qualified individuals to enter the industry has not be available to replace the drivers that retire or leave. Add to this that drivers often have times of irregular income from month to month and it makes it difficult to stay dedicated to the industry. Take into account that most companies will not utilize drivers unless they have 18 months of experience and you are looking at a long time before we can recover from the low wages and lack of new drivers. Rigid delivery schedules - Many shippers and receivers schedule the trucks based on labor and if a driver is delayed shippers and receivers are often not very accommodating and sometimes require the driver to wait overnight or even days to be unloaded. This causes down time and lost wages. As much as a driver can plan properly, they are moving on 18 wheels and tire issues are frequent and trucks can break down. Traffic issues are increasing every year as more drivers are on the road driving down productivity. Chassis Shortages - Over the last few months our drivers have frequently sent us pictures of a bare chassis field at GPA. We have had times where drivers have waited over an hour to find an available chassis and many drivers refuse to go into the port and look because they know there just isn't equipment available and they are wasting their time. Besides heavy volumes, the other reason this is an issue is that many customers consider "demurrage" a dirty word and would rather have the container pulled out and held on the yard to incur per diem than stay in the port past free time. I assume they prefer this method because demurrage must be paid before a container can be picked up where as the trucker gets the per diem invoice so it buys them time since the trucker often doesn't get invoiced for per diem for 30 days and then after the trucker invoices the client they get another 30 days to pay creating a 60 day delay in spending the funds for storage. The issue with this is that it causes chassis to be stagnant waiting for containers to be delivered and not turned to make the next move. Total annual container trade at the GPA has increased 31% from 2,949,449 TEU (twenty foot equivalent units) in 2013 to over 3,851,743 TEUs in 2017. When truckload rates increase we see a shift of drivers working with the intermodal industry to chase the money in the domestic sector. Within the last year we have seen rates within the domestic sector increase over 30%. Please note that our office is closed today due to a heavy mix of freezing rain and snow. The roads are not safe and we have advised drivers to stay off the road until conditions improve. The port in Savannah is closed until further notice. Monday, Sept 11th 1pm - We have experienced the worst of the remnants of Hurricane Irma in the Savannah and surrounding areas and I am happy to report our staff appears to be safe and without harm. Our team members that evacuated will soon begin to return to the area so we can begin accessing any damage. At this time, the authorities have asked us to continue to stay inside and off the roads so that emergency workers can access any risks. This area is also under a curfew which will limit the ability to travel. We can tell from our security cameras that our office still has power and internet. The drop yard and all of the containers on it look to be in good shape. The port is still closed and scheduled to reopen on Wednesday, September 13th. Most of our employees are without power and at this time we do not know when they will regain power. There are areas of flooding and downed trees that will prevent travel on the roads. At this time it is not likely that we will begin to deliver containers until Thursday and after. Please note that import containers will take precedent over exports to minimize demurrage costs. Please be patient as we start rescheduling appointments and understand that we will prioritize in order of Last Free day. Please note that the recent storms are causing rising fuel prices so please expect fuel surcharges to increase. For updates from the port please continue to monitor the links below. Please note that our office is currently closed until further notice due to Hurricane Irma. The port is expected to be closed on September 9th and should reopen on September 13th. Please use this website for the latest updates. The port stopped receiving empties on 9/8. Please see latest notices from the port below. If you, your friends, colleagues, family or Port users wish to receive direct communication from the Georgia ports Authority regarding hurricane Irma, the port has constructed a specific text messaging system for information on this storm and any potential impact on the GPA. The Georgia Ports Authority (GPA) continues to monitor the forecasted track of Hurricane Irma. We remain engaged in active communication with federal, state and local partners. Based on forecasted tracks, GPA is maintaining its current operating condition and continuing with readiness preparations. GPA continues planning meetings with organizational leadership related to operational, preparedness and reentry strategies within departments. We have entered the 48-hour window of potential tropical force winds (39+ mph) to our area. The Ports of Brunswick and Savannah are still at Port Readiness Condition Whiskey with the U.S. Coast Guard Captain of the Port anticipating setting Port Readiness Condition X-Ray at 12:00 PM today. Both Glynn Emergency Management Agency and Chatham Emergency Management Agency are still at Operating Condition (OPCON) 3 and are staffing their respective Emergency Operations Centers (EOC). Glynn County has ordered a mandatory evacuation, which commenced at 8:00 AM this morning. Chatham County has stated it will begin a mandatory evacuation on Saturday, September 9, 2017, at 8:00 AM. This is the latest information we have available on the storm as of the official 8:00 AM update this morning. IRMA has downgraded to a Category 4 hurricane. At 8:00 AM the storm was located approximately 80 miles northeast of Cabo Lucrecia, Cuba and 450 miles southeast of Miami, Florida. Maximum sustained winds are 150 mph and the storm is still tracking west-northwest at 16 mph. Hurricane-force winds currently extend outward to 70 miles from the storm center. Tropical storm-force winds are reported to extend outward up to 185 miles from the storm center. Please note the following operational adjustments to GPA’s terminals. · Garden City Terminal - Gate operations will continue until close of normal business Friday, September 8, 2017. Vessel operations are scheduled to cease at 2400, Friday, September 8, 2017. · Ocean Terminal - Gate operations will continue until close of normal business Friday, September 8, 2017. Vessel operations are scheduled to cease at 2400, Friday, September 8, 2017. · Colonel’s Island - There are NO Gate Operations today and vessel operations are scheduled to cease at 1300, Friday, September 8, 2017. We will continue to monitor the storm as it progresses and will continue with updates to the storm’s track and terminal operations. Please see below hyperlink created for Hurricane Irma blog updates. Also is a listing the GPA’s social media channels as we will keep those updated as well. The last week has been quite eventful for those of us in the city of Savannah as well as the surrounding areas. Most of our employees and drivers now have power after 5 days since Hurricane Matthew's effects. Luckily our office never lost power through the entire event and we were able to watch some of the terrifying sights from our drop yard on our video cameras today. We appear to have picked up all of the containers from the port that were left there as we rushed out of town to evacuation last week before the hurricane. Now, we are anxiously awaiting offloading of the vessels that were finally able to return to Garden City Terminal today. The port reported record volumes yesterday and today seemed quite crazy as well. Due to the delay in vessel arrivals we are expecting next week to be quite busy. Please bear with us as we work to deliver the backlog of containers that this natural disaster is sure to create. Thank you for all of your thoughts, prayers, patience and expressions of concern for us. Please keep our staff and drivers in your thoughts as we continue to repair our homes and clean up the debris and downed trees.